Shoe Personality: Now that's a shoe! I always enjoy shopping for shoes but every so often, I really want to find something that is unique. A classic shoe that will have a little something different about it to make it just that extra bit special. Of course, the need for a standard black pump will always be there - especially when working in a corporate setting - and that is why it's so enjoyable to find and wear a gorgeous, one of a kind pair of shoes on your day off! 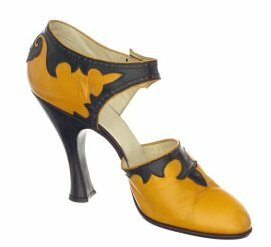 I think that is why I enjoy the shoes from the 1920s so much. Each shoe had such personality! Like this one. If that doesn't just scream "Take me dancing!" I don't know what does.